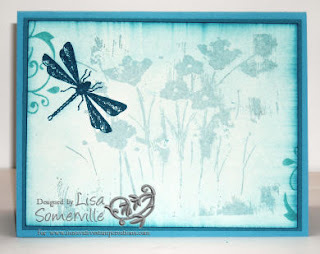 Create a monochromatic card or project using ISC stamps. Simply create your card or project using ISC images only don't forget you need to follow the monochromatic theme - upload your project to your blog (or if posting to SCS please use keyword ISCC9), then leave a comment on the ISC Blog with a link to your card. A random name will be chosen and announced on the ISC blog! The winner will receive a $25 Shipping Spree from ISC! Entries must be posted by August 2. So very soft and pretty Lisa!